For many allergy sufferers, the first sign of an allergic reaction is an uncomfortable tight sensation around the eyes. This sensation results from swelling of both the upper and lower eyelids. The eyelids may also become reddened and begin to itch. A wide variety of allergies can produce this reaction. An allergic reaction occurs when the body's immune system detects a substance, called the allergen, which it identifies as harmful. It initiates a series of reactions intended to protect the body and expel the threat. High levels of histamine enter the bloodstream. Histamine has several effects, the most noticeable of which are sneezing and inflammation of the mucus membranes. This swelling is intended to help prevent more of the allergen from entering the body. Areas with swollen mucus membranes include the nose, the throat, and the eyes. The most common cause of swollen eyes is an allergic reaction to airborne pollen, commonly known as "hay fever." Different types of pollen affect different people, meaning that individuals can react differently to the same environment. Because airborne pollen varies seasonally, this reaction is most common in the spring and summer months. Pollen allergies are relatively common. According to the Centers for Disease Control, approximately 10 percent of the U.S. population has some form of diagnosed pollen allergy. In addition to hay fever, many other types of allergies can cause similar reactions. Animal dander can cause swelling around the eyes, as can the presence of dust mites or mold spores. Other causes are less common but still possible. For example, some people with latex allergies, particularly those with severe latex allergies, suffer from swollen mucus membranes, including around the eyes, following skin contact with latex. 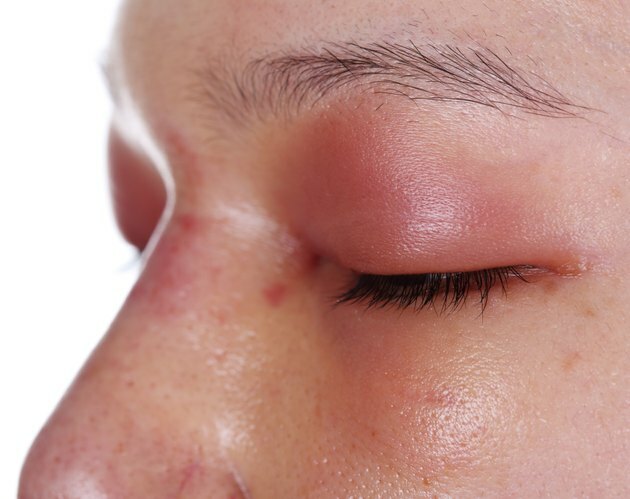 Food allergies, drug allergies and allergic reactions to insect bites or stings can also cause swelling. Swelling around the eyes can usually be treated by drugs that suppress the allergic reaction. Antihistamines inhibit the ability of the histamine in the bloodstream to bond to histamine receptors, reducing swelling and congestion. This type of medication is commonly available without a prescription. Applying hydrocortisone cream, cool cloths or other cool, damp objects such as tea bags may provide relief from the discomfort of swollen eyes. Persistent swelling, or swelling that does not respond to medication, may indicate a reaction that requires medical attention.